Locations as found on the Monopoly board (London edition). Moving swiftly along as ever, let’s return to the Monopoly board (UK edition). This is the only property on the board named for a single building, and that building is, thankfully for our purposes, a pub. Or perhaps rather an “inn”. Though there’s nothing especially precise about any of the terms used for drinking places, it is one of the oldest and represents an establishment that serviced travellers with food and lodgings,1 which the Angel once did. Figure 88. The Angel Inn (Islington N1), now closed. Of course, nowadays it’s neither pub nor inn and offers none of those functions: it’s a bank. There’s a plaque commemorating its inclusion on the canonical Monopoly board, but there’s nothing to indicate its former use (aside from the existence next door of a Wetherspoon’s pub, opened in 1998 and opportunistically named The Angel after its predecessor). Before it was a bank, it was a restaurant. It hasn’t been a pub since around 1921, when it was sold by the brewers Truman Hanbury Buxton to Lyons, who promptly reopened it as the Angel Cafe Restaurant.2 Which means it wasn’t even a pub when the Monopoly board was set. 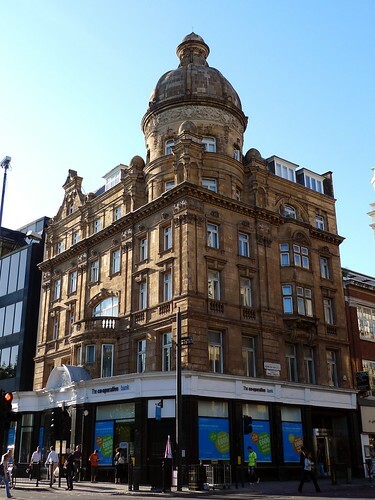 So what’s the reason for its prominence, giving its name as it does not only to a tube station, and by extension an area of London, but also to a (fairly cheap) property on Monopoly? My first post of 2010 (as many as three posts ago) was focused on the Monopoly board, so now that 2011 has come, perhaps it’s time for the second property along, which is Whitechapel Road, completing the brown set. Of course, rents along this thoroughfare of E1 are more than £60 now, but even having shed its 19th century reputation for criminality (a time when there were prominent slums in the area, and Jack the Ripper was committing his crimes), it’s still a relatively impoverished area. Moreover, where the community had originally comprised Jews from Spain and Portugal in the 17th century onwards (with a new influx of Eastern European Ashkenazi Jews in the 19th century), it has since the late-20th century given way to primarily Bangladeshi immigrants, and is now dominated by the smells of the many restaurants and the vibrant colours of the clothing shops and stalls of the street market (which can be found most days along the main part of the road near the Tube station). Figure 78. 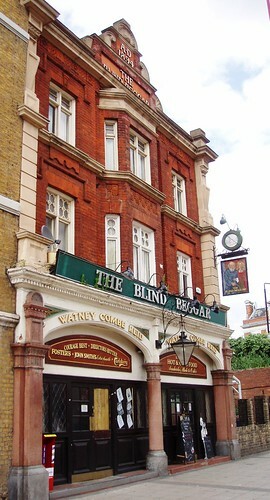 The Blind Beggar (Whitechapel E1). Of all the properties name-checked on the canonical (London) Monopoly board,1 only one of them lies south of the River Thames, and it’s the one that has seen probably the most change over the last three-quarters of a century since that game was created. Of course, the Old Kent Road has always been a major thoroughfare and has changed greatly since it is first recorded, as part of the Roman road Watling Street,2 but the twentieth century in particular has seen a vast amount of post-World War II rebuilding. Vast tracts of it are now taken up by council estates and huge branches of familiar retail chains like Tesco, Toys R Us, PC World, B&Q, Halfords and Asda. Figure 68. 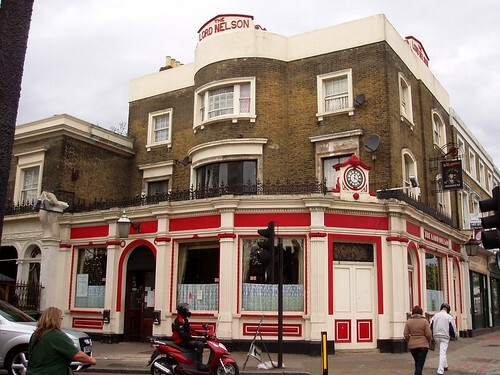 The Lord Nelson (Walworth SE1). This is the London Pubology blog, very slowly dedicating itself to all things in the intersection of PUB and LONDON. For lists of pubs by postcode area, visit my London Pubology site. I have another blog of my film reviews over at Ewan at the Cinema. NOTE: Please be aware that this blog is unaffiliated with pubology.com and was set up in ignorance of this other fine site of the same name. To distinguish the two, I have slightly renamed my own blog "London Pubology". Many apologies to the (late) creator of this site, and to his friends and family. Enter your e-mail address to follow 'London Pubology' and receive notifications of new posts. You won't get many e-mails. These are just some of the many blogs I also enjoy reading on a regular basis. I've put them into some basic categories.